After finding many bottles in the dumpster Edd got the greatest idea of his life. He decided that he would make a recycling center for the entire neighborhood. After hearing this JBC was quick to find Edd the master of this idea. (JBC): So Double-D do you think that this idea of yours will work? 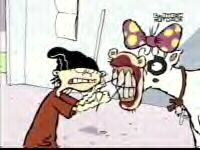 (Edd): Yes I do as long as Ed and Eddy stay out of it. This is Edd's first idea without having help from Ed or Eddy. For the first few days the JBC watched as Edd's business got under way. Even though he wasn't charging anything to have cans, bottles, paper, or plastic recycled he was still a very happy person. (Edd): I just feel so happy that I can help the Culde-Sac out with something as small as recycling. For days Edd's Business boomed until the other two Eds found out. After seeing his great contraption and the line of people waiting to recycle their junk Eddy came up with an idea. (Eddy): We should charge people to recycle their garbage Double- D! After the crowd found out that they were going to be charged to get rid of their trash the whole plan was ruined. 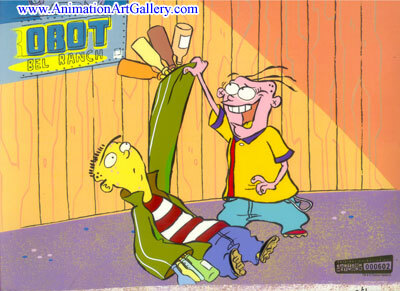 Edd holds Eddy responsible for destroying his plan to clean up the Culde-Sac. Yet he still feels that it was destined to fail from the beginning like everything else that he does. For awhile the Eds have been trying to get their Jawbreaker Bank up and running again. A new plan has been drawn up that the Eds think will work. When asked who started up the business again the Eds responded with this quote. (Eddy) I decided that we should start building up the trust of the kids before destroying it after they give us their jawbreakers. While Eddy plots to steal the culde-sac's jawbreakers Edd has been working hard on the vault itself. The Eds besides Eddy gave us permission to visit the Jawbreaker vault before the bank opened. (Edd) Well as you can see we are going to have jawbreakers from all over the world and they will be labeled for quick reference. From Alabama to New Zealand the Eds are prepared for great business. Each jawbreaker will be placed in its country's bin which will keep them organized. Our one question was how are you going to keep the jawbreakers from being stolen? Ed let us in on the security system that will protect these vast walls of sugar coated candy spheres. (Ed) Imported from an armored truck from the International House of European Weiners I give you the anti-matter lock of the... Uh I forget what we are doing. (Edd) What Ed is trying to say is that the security system is a highly dense structure made out of concrete with many locks. Well we can obviously see that no one is getting into the bank and it looks to us that the Jawbreaker Bank will be a success. About two weeks ago the kids of Peach Creek have reported seeing a metal dinosaur on the loose. Well it turns out not to have been a dinosaur at all. After further investigation Edd has found out that the monster is actually a living organism. JBC was there for the capture of this beast. Here are the actual documented facts from when the monster was captured. (Edd) I saw it go this way come on! (Edd) He went through the woods. He should be heading for the trap that I set. (JBC) Are you sure that this plan will work Edd? (Kevin) It had better work dork or you will be staring at a knuckle sandwich! (Kids) There it goes get it! The monster was then captured by running head first into a tree which knocked it out. But who was the monster? Well we were all very surprised to see that it was Ed. Then we remembered that he had the costume that long and had actually worn it before. This story is very confusing and no one really wants to ask questions. Everyone is just glad that it is over. When questioned Ed had this to say. (Ed) It was lots of fun! Its Back!! The squirt gun you all loved!! And it's from Canada!! Hurry and buy your very own Canadian squirt gun at Edd's House of Imports And Exports. Candy Store Is Short on Jawbreakers! This weekend the candy store gave out startling news. They have apparently run out of jawbreakers. JBC decided to do an interview with the Eds to find out their opinion on this matter. Edd: Not good, not good, not good! Eddy: This can't be happening!!!!? 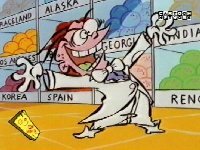 Ed: No more jawbreakers!!!!!!! Nooooooooooo! you plan to buy other kinds of candy. Edd: You know what, we really don't know. Connie: Aww...if I were you I'd just buy other kinds of candy. The Eds probably won't follow her advice. However the candy store is scheduled to get a new shipment in next week. They apologize about this situation and hope customers can still count on their service. Rolf son of a shepard who forever was not understood in his ceremonial outfit struck a deal with American Outfitting Company today. Rolf's ancestrial outfit turned heads across Peach Creek and set off a roar of citizens wanting this new look. His new look is called the "Old Country Look" which is scheduled to hit shelves in March. Rolf as always was confused by these happenings. JBC: Rolf how does it feel to start a new fashion trend? Rolf: Why must you pester Rolf? If I don't finish my chores I will be banished to the cupboard! Still the new line of clothes is predicted to be a major hit as all stores across America prepare for the arrival of this new fashion trend.